Proper training is how you win your first game, but proper recovery is how you win the next one. In a professional setting, it makes a huge difference whether you are playing at 98% or 94% of your full capacity. The difference may seem small, but taking 2-3 more runs than your opponent during a match can lead to one more goal scored, or one less goal conceded. Belgian club KAA Gent uses multiple m-station rebounders in its daily training routines, but not just to improve the players’ technical skills. – We often use the m-station in our recovery sessions. The day after a game we train in two different groups. The players who started the game participate in a recovery session, the substitute players and the players who didn’t play receive a conditioning stimulus. The staff at KAA Gent employs m-station rebounders during individual recovery sessions when each player gets to use his own m-station. These training sessions involve ankle and knee stabilization exercises as well as some general core exercises. According to Stijn, recovery should be addressed in the first training session after a game. There are boring ways of practicing recovery and there are fun ways of doing so. – We consider the day after a game the ideal time for active recovery. This can be achieved through low intensity aerobic activity, such as jogging or cycling/spinning. Players often complain about being bored during these sessions. That is why we often choose an active recovery session with the ball, which emphasizes technique and fun. Therefore, the m-station is very useful to us, as can be seen in the video. Players are often unaware they are engaged in low intensity running. Especially when adding a competition, such as counting the number of bounces on the m-station without touching the ground, players seem to enjoy these recovery sessions more than the aerobic running sessions. 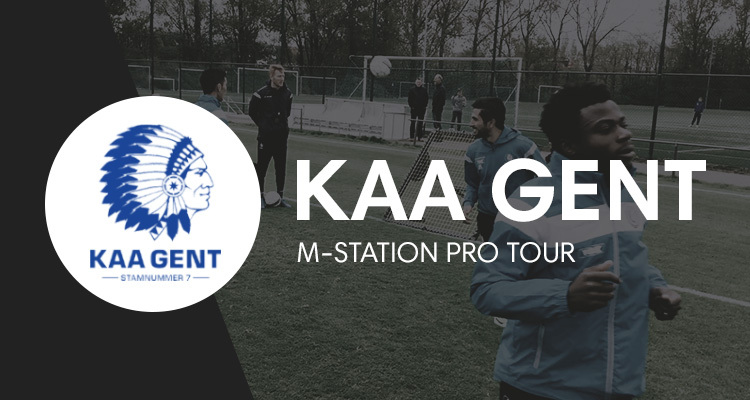 If you have any questions about the KAA Gent use case or if you would you like to know more about how you can use the m-station football rebounder please book a call or get in touch with our Marketing Manager, Simon Secher, on simon@muninsports.com.